I can only imagine how much better the view must have been after the sun set. On a future trip, we’ll have to return and take it in. Sally and Malcolm also joined us. Below, Tawn, Sally and Biing. We were fortunate to have seen the three of them multiple times throughout the trip, and especially fortunate that Biing was available to make suggestions, show us around and take Tawn shopping. You know those people who always know the perfect place to go? He’s one of them. Unfortunately, we had time for only one drink before we had to head to Astor Place. Despite this being our last night in New York, there was still time for a few more Xanga meet-ups. The venue was Grand Sichuan restaurant on St. Mark’s Place. The food was very tasty. Best of all was the opportunity to see Aaron again and to finally meet Tae and Oates in person. Aaron predates Xanga as a friend, going back to an early visit I made to New York City with a friend and former colleague from my days in Hong Kong. There was a large group of us having brunch at Danal, all of whom were Cantonese speakers except myself. While I don’t expect a whole group to speak English just to accommodate me, Aaron was the one person who made the effort to be inclusive. Since then, our paths have crossed again and again and he’s even gone to teach with me in Bangkhonthiinai. Tae and Oates are two other Xangans, both Thai, with whom I’m been interacting almost since the start of my blogging days four years ago. It was fun to be able to meet them and I hope they’ll come back to visit Krungthep again soon. Sadly, none of the three update their blogs with much frequency anymore. 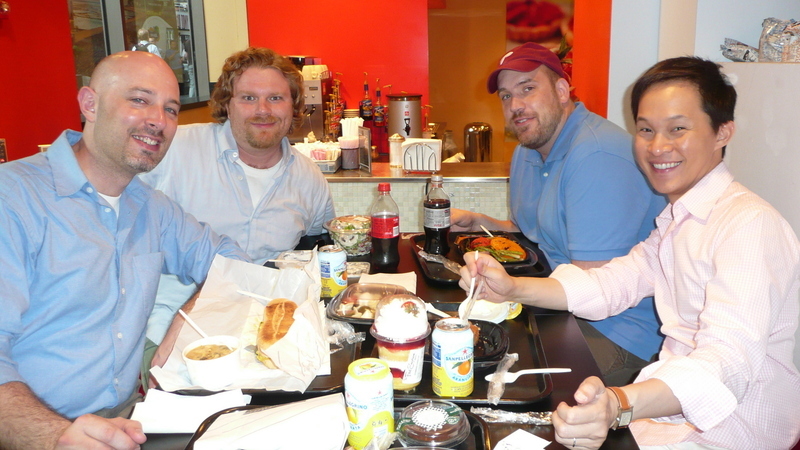 From left to right: Brad, Tae, Oates, Aaron, Tawn and Chris. Saturday morning, our final day in the Big Apple, Tawn wanted to sleep in so I went down to the Village for one more serving of truffled egg toast at ‘ino and a latte. Oh, you can just imagine how much trouble I got into with Tawn for doing that. “What!? I wanted to go there, too!” he said when I returned to the hotel room with truffle oil on my breath. 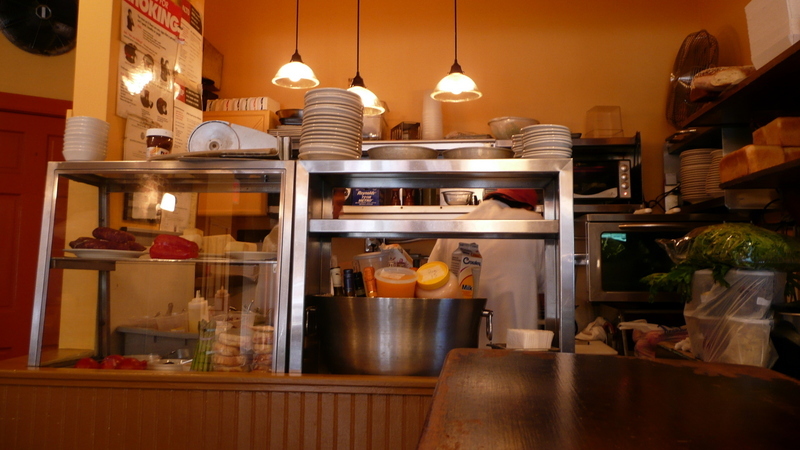 While there, I snapped this picture of their extremely small but functional kitchen. It is about the same size as my kitchen at home and, I tell you, I need to do some seriously remodeling to fit in nearly as much equipment and shelf space. Once Tawn was up, we headed to the Chelsea Market on Ninth Avenue at 15th Street. Housed in the former Nabisco factory where the Oreo cookie was invented, it is now an urban food concourse, similar to Pike’s Public Market in Seattle, Victoria Market in Melbourne or the Ferry Building in San Francisco. Most of the vendors produce cooked goods, although there is a fresh fish monger, too. Best of all, there was a location of Amy’s Bread, one of my favorite bakeries in New York. 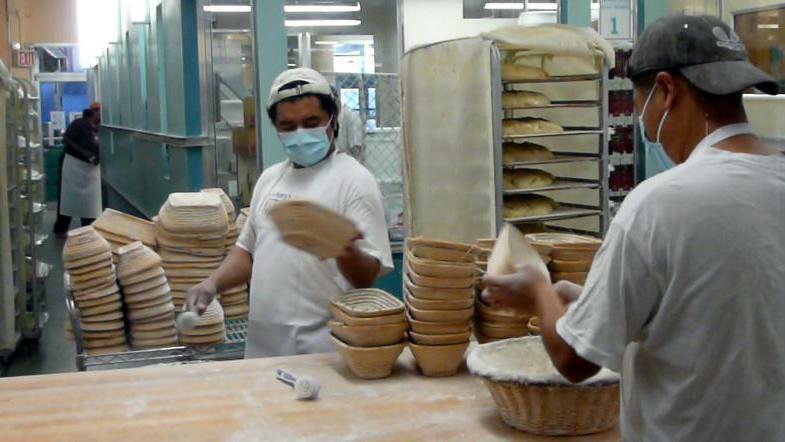 Their entire production complex had large windows so you could follow the process from proofing, above, to shaping and baking, below. That reminds me, I would like to get a few of those bannetons, the baskets used for proofing the loaves, shown in the photo above. 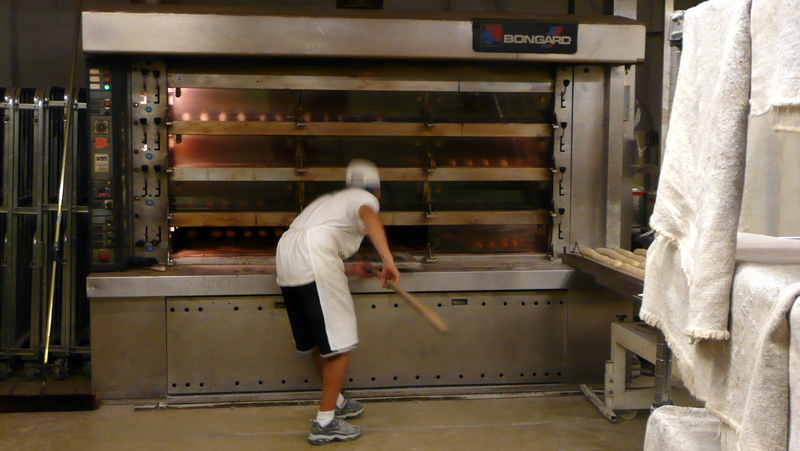 I suppose it is unnecessary to tell you how long I could have stood here, watching them make bread? Our reason for being over on the west side of Manhattan was two-fold: we were supposed to meet my high school friend Scott and his partner, who were driving in from Philadelphia, and Tawn was also supposed to meet his second cousin, who lives in New York and was recently married. We headed our separate ways for this, since planning and scheduling hadn’t worked out so well. Brad and I joined Scott and his partner Michael for a visit to High Line Park. Several other people have photographed and written about this extensively (Rob has entries here and here that are worth checking out), so I’ll simply explain that the High Line is an old viaduct that allowed trains to deliver and pick up from the meatpacking and manufacturing districts without interrupting the flow of vehicular traffic. 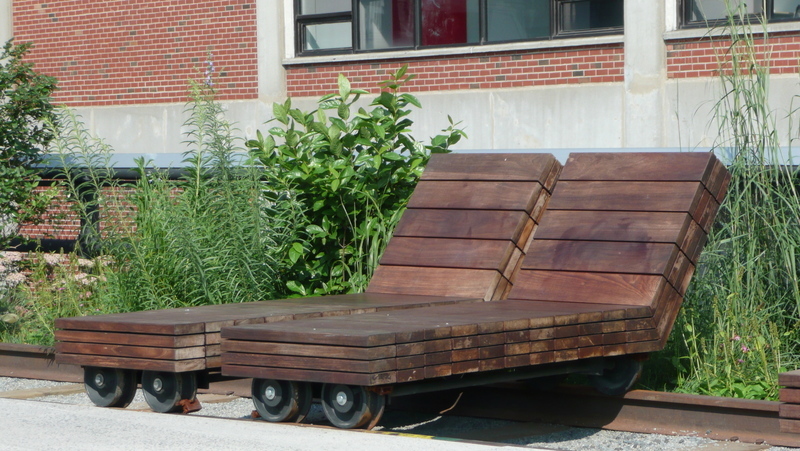 Having long since been out of use, the line was going to be torn down but was instead saved and renovated as an elevated urban park. The space is fantastic, giving unique views of the city and featuring much of the same flora that had naturally overtaken the old tracks. One point of the park has this seating area that looks down onto the street, sort of an opportunity to view everyday life on the street as theatre. This would seem boring, I suppose, but while we were there, a scantilly-dressed lady in sandals came running around the corner and down the street, crying out after her small dog, which was on a tear, his leash dragging behind him. Despite the sandals, this amply-endowed woman was making good time along the avenue, although her dog was faster, dodging onlookers who helpfully tried to catch him. The park also features benches and lounges from which you can enjoy the beautiful weather. These were interestingly mounted on the rails and could be rolled together or apart. Most of the buildings in the area are converted warehouses, although some newer structures (I believe this is a hotel) are making their appearance. A third segment of the park is still under construction on the north end, which will run from 20th to 34th streets, doubling the length of the park. In my previous entry I talked about some of the changes being made in the city that make it more pedestrian friendly and more human in its scale. 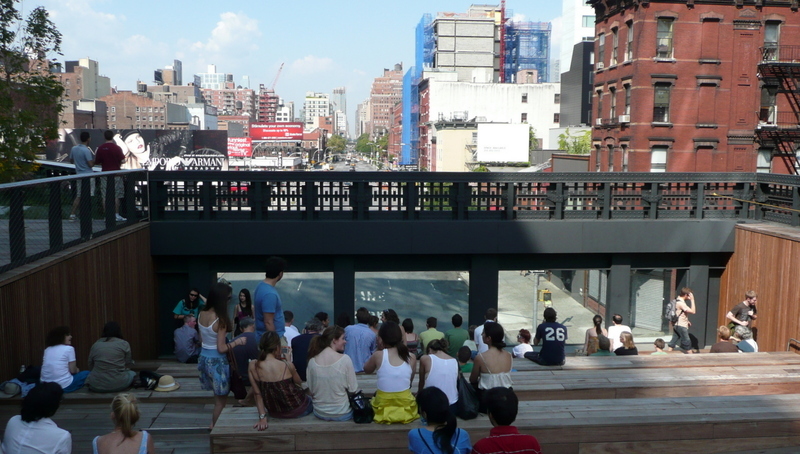 The High Line is definitely one of these improvements and well worth checking out. We returned to the Marriott Marquis to check out then went for a bite a few blocks away before Scott and Michael, who were heading past Newark on their way back to Philadelphia, dropped us off at the airport. Above, Chris, Scott, Michael and Tawn over a quick dinner. I hadn’t seen Scott in twenty-one years since graduating, although we had been good friends in junior and senior high school. It was fun to meet up again and I’m glad we’re back in touch. Tomorrow, the long-awaited entry on dinner at Le Bernardin. 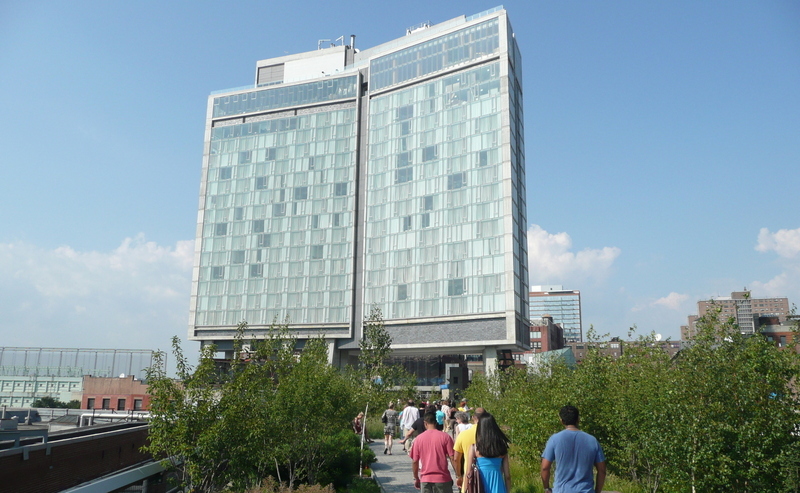 This entry was posted in Uncategorized and tagged High Line Park, New York City by christao408. Bookmark the permalink. darn! almost. You are having a ball over in NYC lost that shot of the Empire State Building and ya’ll. @Redlegsix – Ruth Ann, we arrived back Monday morning. @ElusiveWords – Strangely, I’ve been able to manage the jet lag pretty well so far. Uncharacteristically, I slept a lot on the plane. @Jillycarmel – Yes, the view of the Empire State is amazing, isn’t it? @TheLatinObserver – Thanks for the article link, Rob. I realized you actually had several other entries of High Line pictures to which I should have linked, but I assume once they see the final two, people can work their way to the others. @deedee8370 – Yes, it was a mini-reunion! High Line Park is so interesting! I didn’t know about it. @Rm2046 – Thanks. I’m creating little Google Maps and putting them on the front page of the blog as I go. Just is kind of time-consuming. Will get to NY soon, though. @Dezinerdreams – Well worth a visit on your next trip to NY. wow, so many things in nyc that i didn’t know about. i’ll have to add those to the list of places to visit! I love that rooftop garden! 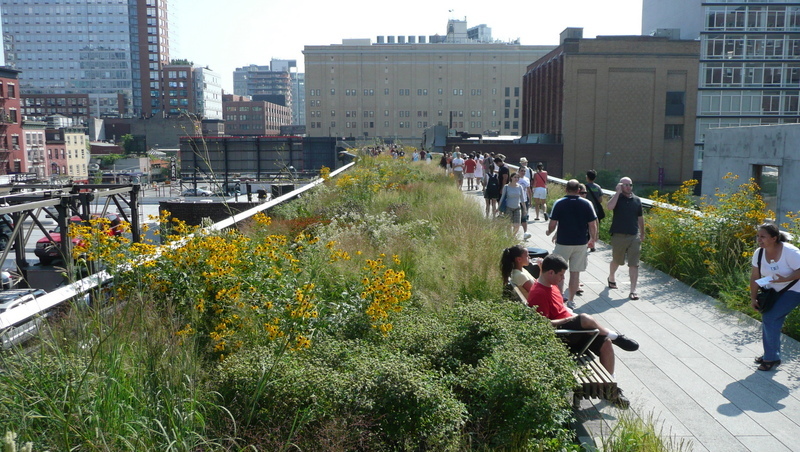 The High Line Park is a fantastic idea. They should do something like that in Bangkok to create more green spaces in the city… maybe the sky walk way from Central World to Siam Paragon. Busy trip! Goodness. It seems like you barely had time to breath… but I guess you were able to really do a lot. You and Tawn are tanks. Next time I am going with you, wherever, I don’t care. Jeez! You make the most of even the simplest things and describe them like they are out of this world. Great entry Chris. Ooh, your truffled egg got me thinking about this mushroom store at the Ferry Building… and then you mentioned the Ferry Building =)I saw the park pictures from another Xangan. If and when I get an interview from NYU or Columbia, I’ll go there for sure.You know I can’t wait for the dinner story!!! I can’t hold off anymore, I have to say it.I like Tawn’s hat a lot! =PIt looks so cool on him!Yeah, Cantonese speaking people can be SO rudeand inconsiderate! =PI’m glad Aaron is around, he is a nice guy.Love your photos and your travelblog! @yang1815 – Didn’t seem like they would travel well. Plus, I’d have ended up eating on the subway. @kunhuo42 – Yes, there are so many places to go and so many things to see! @TheCheshireGrins – It’s great. @beautyandthebum – Isn’t that the truth? I just mentioned this to Tawn when we arrived Monday. Perhaps we could use the Airport Express rail tracks, as it seems like that project will never open! @secade – Rest hard, play hard…@ZSA_MD – It would be wonderful to travel with you! mushrooms —> mushroom store at Ferry Building in SF I like how your mind works! @ZenPaper – Oh, you know Aaron? Yes, he is a dear and I wish we could see him more often. That first pic is so awesome. I tried to get a pic of Felix similar to that in HK but it didn’t turn out like that one! Chelsea Market is one of my favourite places to go when I’m in NYC…so many sweets!!!!! 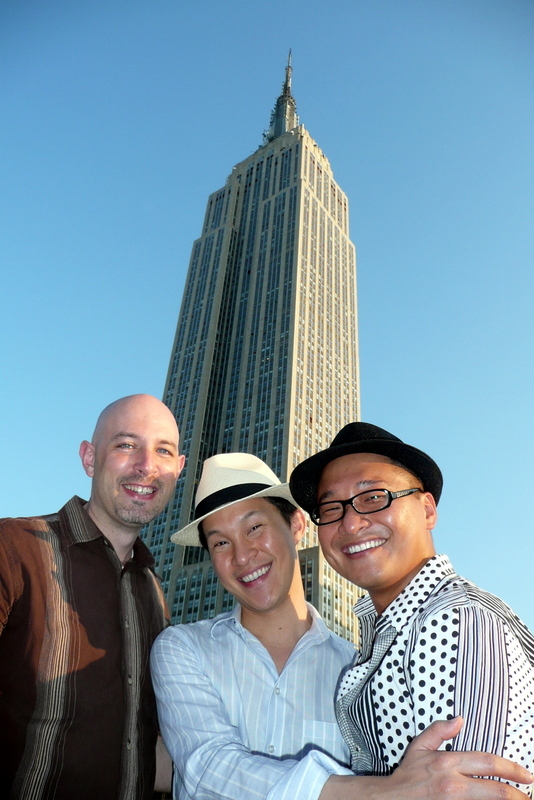 the first pic taken is soo good…… captured the blue sky with a nice angle of the Empire state building and 3 of you…..
@Biing – You’re welcome and you don’t look fat at all! @brooklyn2028 – We’re lucky, our frind Malcolm, who is a filmmaker, took that photo. Always send a professional to do an amateur’s job! @agmhkg – Thanks, it really turned out nicely, didn’t it? @susanloo2002 – Be careful, Tawn travels mighty heavily!